Baba's Cafe offers a wide selection of freshly prepared meals, light bites and drinks. 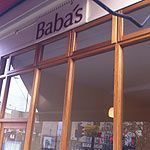 What did you think of Baba's Cafe? It’s not that there aren’t undiscovered gems out there, but eateries that can genuinely surprise, delight and, above all, offer a true bargain – especially in gentrified territory like Greenwich village (uk, not nyc) – are virtually unique these days. You can’t blame them for trying to seek profits in such a risky business, but when they do give value and pleasure such establishments deserve to be nurtured and for the word on the street to become a torrent.